Our book's meat-riffic recipes have led to many visits to my local butcher shop, The Meat Hook. With another final push happening right now, Brownie and I have spent most of our waking hours this weekend testing and revising recipes in order to get everything just right. Of course, this also meant a few more visits to The Meat Hook, passing through The Brooklyn Kitchen, trying not to blow my budget on mugs or glasses or paper straws. Or bread from Roberta's. And in this last mission, I have failed. I have epic failure. 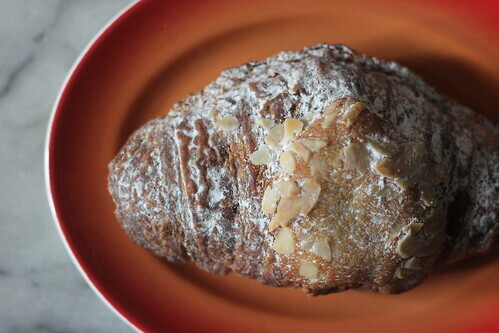 It started last Saturday when, during my afternoon visit to pick up various meats, I immediately spotted a lone almond croissant as I reached the top of the entrance ramp. The box seemed so empty, the croissant wanted a friend. Too bad, I say! I snatched that croissant up like it was the last croissant that will ever pass by the painted cow. And it was ah-mazing. I firmly believe one of the butchers was trying to get me to give her my croissant. She needed to recognize! As if this debauchery wasn't enough, I completely picked up a crusty loaf of French bread yesterday. My lunch may or may not have simply been bread dipped in olive oil. Having such easy access to this bread is dangerous. Oh, check out the Behind the Scenes of Roberta's bread baking.